Quantum Limit.com: Gentlemen, start your rockets! Dennis named Steve Fossett, Richard Branson and Burt Rutan as three members of a 21st century power team. I want to introduce you to another man who I think deserves to be included as one of the great movers of our time. Peter H. Diamandis the visionary organizer. 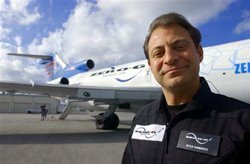 Dr Diamandis was the man who organized the famous $10,000,000 Ansari X Prize. That competition started a world wide race to build a reusable suborbital vehicle for space tourism which was eventual won by Rutan with Spaceship One. Dennis has already described what a breakthrough that was. But thats not enough for Diamandis. He wants to open up space for the ordinary person. Thats going to require people who can think out of the box. It requires innovation , public interest and passion. Importantly it requires money. How do we achieve this? How about rocket racing. Each vehicle will be capable of approximately 4 minutes of intermittent engine boost and 10 minutes of un-powered (glide) flight, allowing for 3-4 laps around the course between pit stops. Vehicles will launch in a staggered fashion to ensure that vehicles are always airborne. X-Racer drivers will be allowed to "bunch" vehicle s under controlled environments throughout the race to enable a race environment and lessons learned. To offer the race fan a true feeling of speed and power, a variety of cameras will follow the race from balloons, chase planes and the cockpits of vehicles. A sense of danger and excitement will surround the high profile X-Racer pilots creating a hero status environment for race fans. The X- Racer pilots will be today's version of the "right stuff". Now these races will only be subsonic and won't be flying into space, but they will help develop the rocket engines, avionics and ground operations commercial spaceflights flights will need. Just think about this. Each race will have up to 10 rocketplanes making four to eight pits stops in 90 minutes. That up to 80 separate launches a race. In a few race meets the rocketeers will have launched more manned reusable rockets then NASA has in its entire history. Diamandis is still a young man, don't be surprised if he organizes the first sports Moon race. SCIENTISTS examining the first dust samples collected from a comet have found complex carbon molecules, supporting the theory that ingredients for life on Earth originated in space. The organic material was found in early studies of samples from the comet Wild 2, brought back to Earth by the Stardust space probe seven weeks ago. Stardust collected hundreds of grains of dust as it flew through the tail of the comet two years ago. Analysis suggests a high concentration of complex molecules of the kind thought necessary for the evolution of life.
. "We want to know ... how organic molecules actually form in comets and whether they helped deliver organic material to the Earth before life began," Professor Brownlee said. Now if comets can deliver organic material to Earth the can do the same for Mars and the other planets. The Lunar biolab looks better every day.